A twentieth-century classic, Appointment in Samarra is the first and most widely read book by the writer Fran Leibowitz called "the real F. Scott Fitzgerald." In December 1930, just before Christmas, the Gibbsville social circuit is electrified with parties and dances, where the music plays late into the night and the liquor flows freely. At the center of the social elite stand Julian and Caroline English-the envy of friends and strangers alike. But in one rash moment born inside a highball glass, Julian breaks with polite society and begins a rapid descent toward self-destruction. Appointment in Samarra brilliantly captures the personal politics and easy bitterness of small-town life. It is John O'Hara's crowning achievement, and a lasting testament to the keen social intelligence of a major American novelist. About John O'Hara (Author) : John O'Hara is a published author of young adult books. 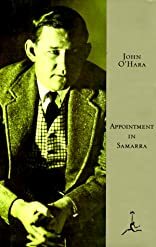 Some of the published credits of John O'Hara include Appointment in Samarra.